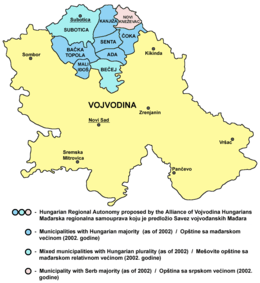 The Alliance of Vojvodina Hungarians (Hungarian: Vajdasági Magyar Szövetség (VMSZ); Serbian: Савез војвођанских Мађара (СВМ) / Savez vojvođanskih Mađara (SVM)) is an ethnic Hungarian political party in Serbia, primarily active in the province of Vojvodina. Its chairman is István Pásztor. The former party chairman József Kasza was an honorary president of the party until his title was revoked because of various disagreements on party issues. At the 2004 provincial election in Vojvodina, the party won 8.50% of votes in the one-round voting system, and was part of the ruling coalition in the Vojvodina provincial parliament. At the 2008 provincial election in Vojvodina, the party was part of the Hungarian Coalition, which won 7% of votes in the first election round. At the 2012 provincial election in Vojvodina, the party won 6.15% of votes in the first election round. 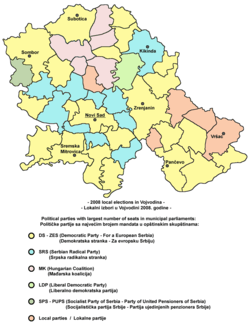 In the 2004 local elections, the party won the largest number of seats in the municipal parliaments of Subotica, Senta, Bačka Topola, Mali Iđoš, Kanjiža (where Reformists of Vojvodina won same number of seats) and Čoka. 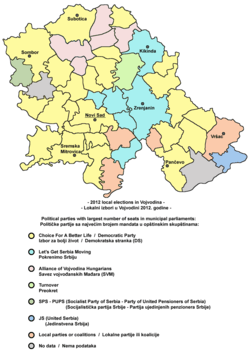 In the 2008 local elections, the party was part of the Hungarian Coalition, which also included two other ethnic Hungarian political parties in Serbia, and which won the majority of votes in Kanjiža (50.91%), as well as plurality of votes in Senta (31.87%), Bačka Topola (46.25%), Mali Iđoš (37.18%), and Bečej (29.63%). Since the introduction of the multi-party system in Serbia, the mayor of Subotica was often from the Alliance of Vojvodina Hungarians. That has changed after local elections 2008, when Democratic Party won the largest number of votes in this city. In the 2012 local elections, the party won the largest number of seats in the municipal parliaments of Kanjiža, Senta, Bačka Topola, Mali Iđoš, and Čoka. Democratic Party won more votes than the Alliance of Vojvodina Hungarians in Subotica, Bečej, and Ada, in which largest part of population was of Hungarian ethnicity, according to 2002 census. Bracketed numbers indicate number of seats in parliament. Wikimedia Commons has media related to Alliance of Vojvodina Hungarians.